Beating Adwords - Are You Getting Slapped By Google? Take a deep breath.. there is no need to throw our computer out the window due to frustration with Google Adwords. If you are like tens of thousands of Internet marketers that have been slapped in the face by Google, you have a right to be upset. Have your bid prices at Google gone through the roof? Have your keywords been set to inactive for search? Are you having trouble getting the results you should expect from the money you invest into Google traffic? If your see profits steadily declining, or are wanting to learn the RIGHT way to advertise with Google Adwords, STOP fumbling around and learn how to finally put Google at the end of a sucker punch. You need to know how to achieve $0.01 bid prices and get traffic from Google for literally pennies. You need to know exactly how Google wants you to setup your Adwords account so that you can achieve the best Quality Score possible. Discover the techniques and strategies that we have taught thousands of successful Google Adwords Internet marketers. It is now your turn to unleash the power of Adwords to drive the highest quality traffic to your websites to make some serious cash. Our Names are Kyle and Carson, better known as the Wealthy Affiliates. We’re a couple of guys that started off like many of you, wondering if we could make money online. About 5 years ago we met in University on our way to getting our degrees in computer science. We decided to invest some time and a little money to find out if we could make money on the internet promoting products/services for companies with affiliate programs. We found a few markets that had a good return on investment and the rest is history. Now we are pulling in more money every month using Google Adwords than the average person makes in a year. We don’t think we’re better than you because we make a lot of money, and we know that with proper coaching and guidance you could also be in our shoes. We make a lot of money on the internet, $1000’s / Day, but the reality is that you could be making this much too. There is just so much opportunity and money to be made, but very few people know how to harness the power Adwords. If you are new to Internet marketing and are unsure of what Google Adwords is, then you NEED to learn how to get started on the right foot. Learn our step-by-step instructions on how to get your first ads created and how to attract the RIGHT group of people. Google offers the highest quality traffic available anywhere online and you need to discover how to harness this power and use it to your advantage. We know what we are doing. This is an Adwords account of ours that has over 1.4 Million Clicks. Take a further look at our CTR, Cost Per Click, and Conversion Rate. Drop what you are doing right now, throw away those stale marketing techniques that aren't making you a dime, and get started with Beating Adwords. Why Do You Need Beating Adwords Anyway? We have many questions from people that include these words. “Can you help me make money online?” The answer to that question is YES. Our techniques have helped pure beginners with no internet marketing experience go from making nothing online to making $300 + / day in a matter of months. It’s really amazing to see that with some guidance, dedicated individuals can bring themselves closer to the financial freedom that they’ve always wanted. Google Adwords is always making changes that can negatively affect their campaigns, actually they are DESTROYING campaigns. You may fall into this category, and you may not. However, we can tell you this. We have figured out the "secret Adwords formula" that will allow you to promote any product you want, under any keywords, for lower than any other advertiser. As soon as Google makes a change, we are right on top of things, and figure out how to get around the changes in a matter of days (if not hours). We then make the appropriate changes to Beating Adwords to reflect these changes so you can have the most current solutions to Beating Google Adwords! We also will give you free updates for LIFE! We’ve personally coached 100's of internet marketers and taught them techniques that can increase their Return on Investment up to 100% within a few days. It’s just a matter of knowing how to implement the right techniques at the right time. Beating Adwords is the most up-to-date book on how to make money online. We have literally invested $100,000’s refining the techniques and strategies that have been included in this book and the information that you will receive is leading edge. If you are serious about making money online, this is definitely the first and last place you need to look. Beating Adwords includes online marketing tactics that have never been revealed and have been proven to generate huge profits time and time again. Beating Adwords is for anyone. Whether you have no experience with internet marketing, or whether you have been marketing for years, this book is an asset to anyone’s repertoire. We tell you how to make money the exact same way that we have and continue to do. We do not leave any of our secrets un explained like most other so called "make money" programs that are available. We tell it like it is. If you are already be making money online, we guarantee that you could be making more by simply knowing the secrets of Google Adwords and how it works. If you’ve never heard the term “Quality Score” or if you don’t know what it means then you could be losing thousands of dollars a month in sales, and in wasted advertising costs. Beating Adwords has been built with the Beginner and Intermediate Marketer in mind, and for that reason it is the best Marketing resource available on the internet today. Has Google Slapped you in the face with one of these? Set your keywords to "inactive for search"
Are your sales dropping from once high levels? Earning $1000 per day doesn't happen over night. Other guides claim that you can make thousands of dollars a day by working 30 minutes or less a week. LIES, LIES, LIES. They may forget to mention the fact that it may have taken 100’s of hours to set up these successful streams of income. It is possible to leave things on autopilot, but not without putting in a lot of time setting up first... correctly that is. We will step you through the correct way to set up your Adwords Account so that when the time comes, you can put your campaigns on autopilot and watch the money roll in. It simply amazes us how little people know about Adwords, even if they have been successfully making money online for some time. Many new changes have been implemented by Google recently and we touch on all of these subjects, teaching you how Google wants you to advertise. The facts about our techniques are that you do not need a website, or a product, or thousands of dollars to start. You can start earning money online as soon as you’ve put the time into reading this guide. If you like to be coached, then Beating Adwords is going to blow your mind away. We have included step by step instructions on how to get every aspect of your internet marketing realm set up and along the way we provide you with tips on how to do it correctly. We don’t believe in simply mentioning something without going into detail. There is no point in doing this as it only confuses the issue. Internet Marketing is a very detail oriented business and without proper instruction you can end up losing a lot of money fast. We know people who have spent literally thousands of dollars buying e-books online and they still have no idea how to get started. Why? Because no other book goes into the detail that Beating Adwords does. The flow and design of the book are great and it is very easy to navigate while you learn. You’ll like how things are easily laid out and are provided in steps. As you read through the many sections of the book you will notice the level of detail increase. Once you’ve read through the start up section you will be instantly thrown into a pool of tips, techniques and methods that we use, and teach on a daily basis. If you are an intermediate marketer you have to ask yourself this question. How do I outsmart my competition? More importantly, how do I make sure that I can compete with people who have more money, resources, or time? The Answer to your question is that you need to harness the pure power of Adwords. Do you have adgroups with a CTR as low as 1%? Many people even have less. We know exactly how to consistently get your CTR up over 20% or 30%. It’s simply a matter of knowing the secrets that Google doesn’t tell you. ... Because they make it difficult to succeed. There is no reason to think that Google doesn't want you to succeed. The better you do with your advertising, the more money you will spend on driving traffic to your sites and affiliate links. Google rewards their advertisers who perform at a high level. The problem is that most advertisers are misinformed, or out-of-date with their marketing techniques. Google is nothing like it was 2 years ago, and you need to stay current. Beating Adwords shows you Step-by-Step how to make money online. You DO NOT need any previous experience or special technical skills. There is something for everyone, regardless of your experience level. "If you want to shatter the mystique around google adwords, this is the book for you. Jam packed with money and time saving tips, a great instructional guide for beginners, but with advanced techniques and secrets for more experienced marketers. Beating Adwords is well written in an easy narrative, detailed but not verbose. If you use Adwords to sell anything, this is a 'must have' for your library." "Hi guys I've just purchased your ebook and its perfect its so easy to understand and its advanced at the same time! all i can say is a HUGE THANK YOU for this masterpiece and above all your HONESTY in what you say your book delivers. thanks guys." "I've read Beating Adwords twice, and must say it's an excellent book for beginners. I can't say how well it is for intermediate or advanced internet markets, because I'm not one myself, but from the content in it you can easily tell how the book can give you the knowledge to make your Adwords profitable. I used specific techniques that Kyle & Carson mention in the book and got an instant sale online, which gave me more than a 800% profit. It doesn't get much more profitable than that! The book is extremely easy to read, and very well laid out. Trust me, this book is worth it. You'll make the money you spent on it back within a week if you use the techniques they give you! Just remember to keep at it, because everything comes with hard work. If you're not ready to dedicate a little time, then it's not for you. Also, if you think you're incapable of making ALOT of money off of Adwords, you should take a look at the authors. They were living a hard life with no money and found success themselves. Now they show you their invaluable techniques to gain an upper hand in life, too." 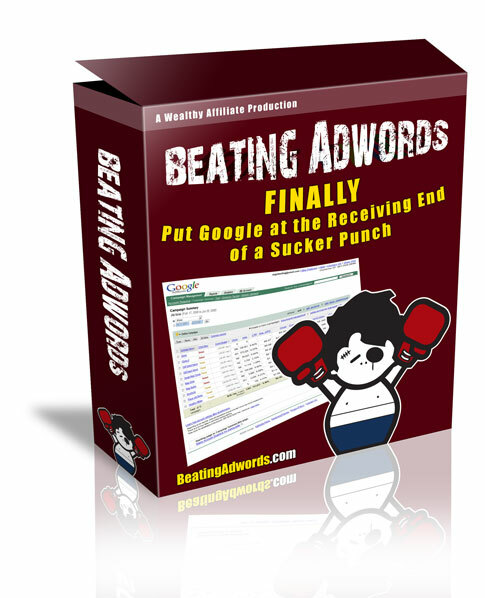 "I have just purchased the long awaited "Beating Adwords" and can honestly say: "WOW!!" It is packed with useful info and is very motivating. I have purchased one of the most powerful tools for internet marketing. Nice going Carson & Kyle!" The techniques in Beating Adwords will teach you how to promote Affiliate products online and it DOES NOT focus on teaching you to simply promote Beating Adwords its self. Such products are considered "Data Entry" products and we feel very strongly that these programs are misleading. There are literally tens of thousands of great products just waiting for you to sell using Google Adwords, and we will teach you how to find them, how to build effective Adwords campaigns for them, and how to take full advantage of the Adwords system. ...But You Can Earn Like This! How Do You Get Your Copy of Beating Adwords? Beating Adwords has been created in digital format and you will be instantly given access to it upon ordering. You can literally start your internet business right now. If you're already making money online, you can start increasing your Return on Investment today. To order, simply click on the Order Now button below and you will be one step away from Taming Adwords and Beating your Competition. You'll be amazed at how this book will change your life. This book is intended for people who are motivated and self driven to make money. If you think that making money does not take any work, then you may be in for a surprise and should continue with your 9-5 job. If you are willing to work hard an use the techniques within this book, you will make money! The information is in Beating Adwords is worth $1000’s. You could spend upwards of $5000.00 if you went to a seminar or conference, and few to none of the techniques and strategies shared within this book would be covered. We know how to make money, and we have provided techniques that have cost us $100,000’s to refine. Think of the opportunity that awaits you. You have the potential to make any amount of money you want with these techniques. Whether you want to make an extra $50/day or $1000/day, we give you the strategies to make this a reality. Beating Adwords is the only investment you will need to learn how to make money online. We know exactly what it takes to make money online and succeed as an Internet Marketer because we have learned what techniques work, and what don't. We practice the techniques that we talk about on a daily basis; we know that Beating Adwords is complete. It can help beginners get started and Marketers with some experience fine tune their advertising campaigns so that they can start increasing their online profits. We are experts and we make a lot of money online. What we've written in Beating Adwords will help you, and we Guarantee it. You will LEARN the techniques and secrets to make yourself a very healthy income online. We never claim to do the work for you, so if you are not willing to LEARN and put in some work then stop right here. Most people try it for a week, decide that it is too hard, and give up. The 10% of people who are serious about making money online give themselves a chance. The techniques that you will learn have been discovered, used, modified,and tweaked, by us for the past 6 years and we've made MILLIONS doing so. Beating Adwords doesn't just explain how everything works, it shows you step-by-step. You can literally follow the procedures page by page, and set up your first advertising campaigns. There are a lot of resources out there that claim to be "THE BEST" of the best. Go ahead and check them out, but the fact of the matter is that you will find yourself back on this page wanting to learn more. The most common comment that we get from e-mails is that people have tried many other "Get Rich Quick" schemes. Books that promise millions, or instant wealth. We're sorry, but if you're looking for this please turn away now. Beating Adwords is a fully comprehensive Internet Marketing Guide that focuses on making money online using Google Adwords as the driving force. We tell you how to get started, how to find profitable industries and hot products, how to set up your advertising campaigns, how to write ads that will blow away your competition and how to find the niche keywords for any industry. You'll be slapping Google in the face when you can get bid prices for $0.01 per click, and you'll be achieving top positions in Google. The problem that most people have when they start learning about Internet Marketing is that they try to rush. Everyone wants to make money right away, but patience will ultimately decide whether you will become successful or not. The odds are against you, but with Beating Adwords you will have everything you need to succeed. We use the EXACT same techniques every single day. As a promotion, we are offering Beating Adwords at discount price of $67.This price is subject to change and may go up at anytime. Don't miss out on another opportunity as you can easily recoup the cost of this book in a matter of days. Beating Adwords will change your life forever. Special Offer!! $67.00 if you order now.